Working again with the crew at The Mad Hueys, we were asked to work with them to create another point-of-sale item to accompany their previous display stands. 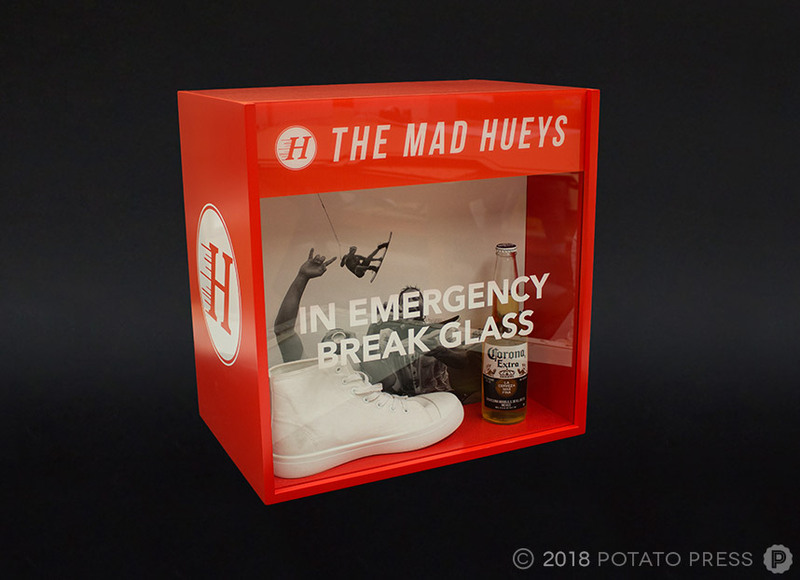 This display stand was made to look like an emergency fire box that will be fitted out to hold a beer and a shoe for an emergency shoey, an Australian ritual often undertaken as a bringer of good fortune. 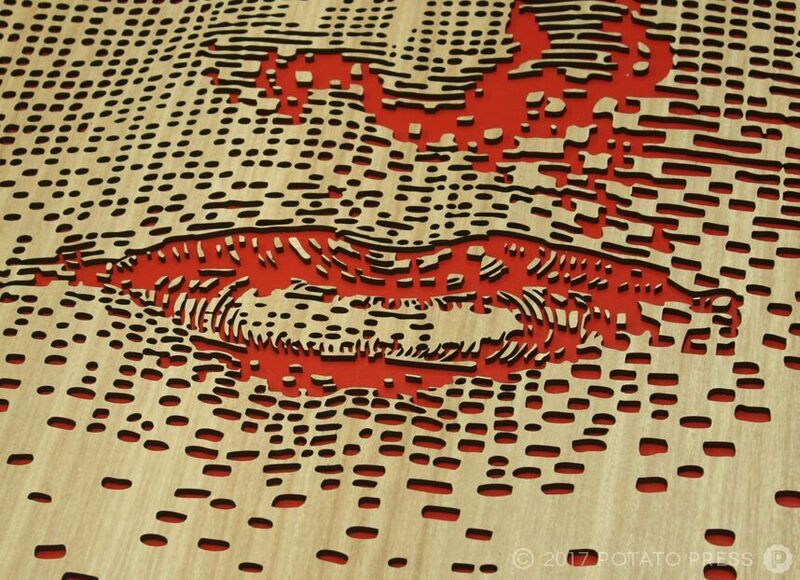 The boxes consist of intricate joinery and completed with a satin emergency red paint finish. 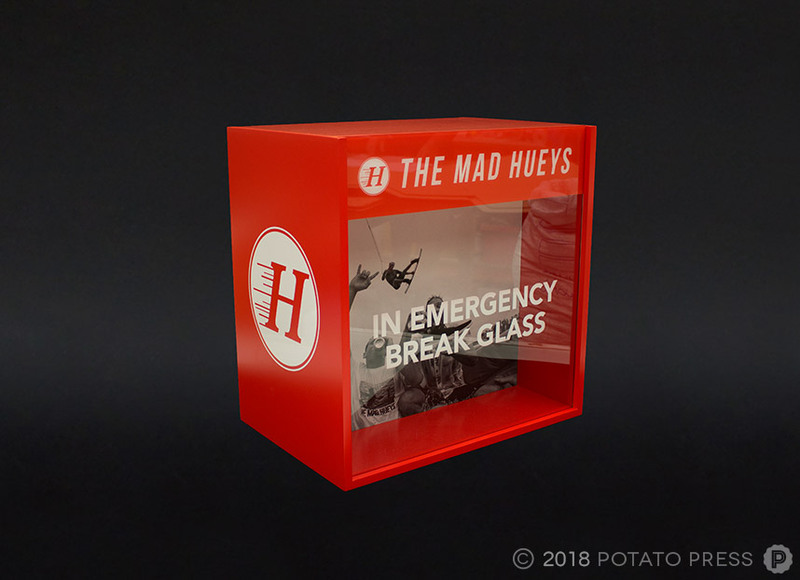 The boxes are double sided so they can be placed either on a shelf or in the middle of the room and be viewed from many angles, rather then your average point of sale strut cards which are only viewed from the front. 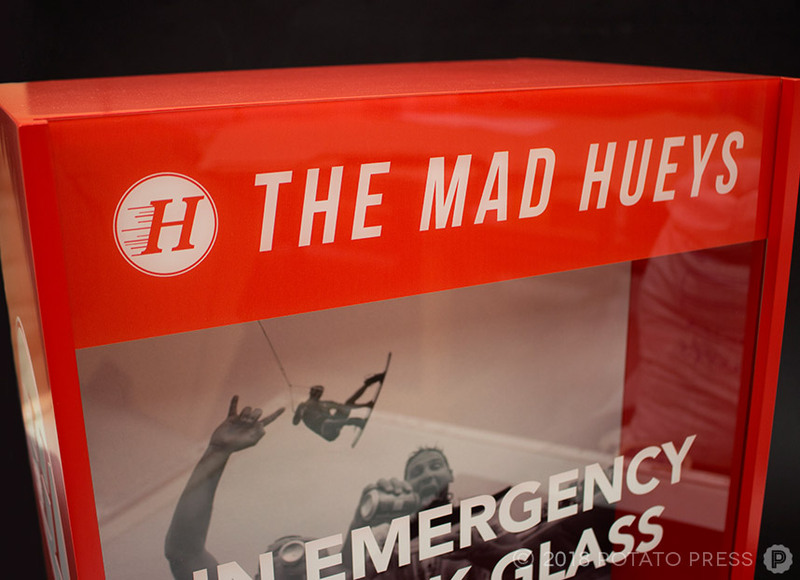 The box features an acrylic panel at the front with printed graphics and text. The lids can be slid up and down so the graphics on the internal of the box and the shoe/can of beer can be interchanged with the seasons. 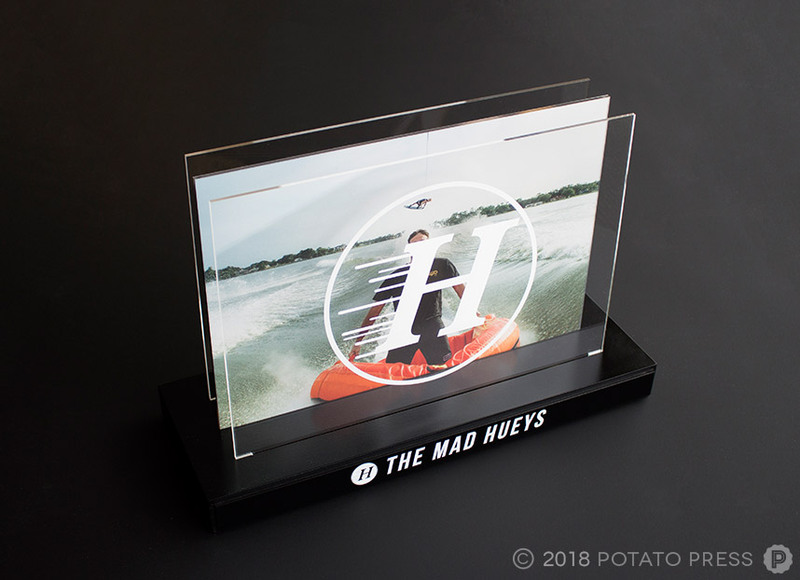 The box also displays large logos on the sides so that even from the sides, the customers will know the Mad Hueys are up to something. 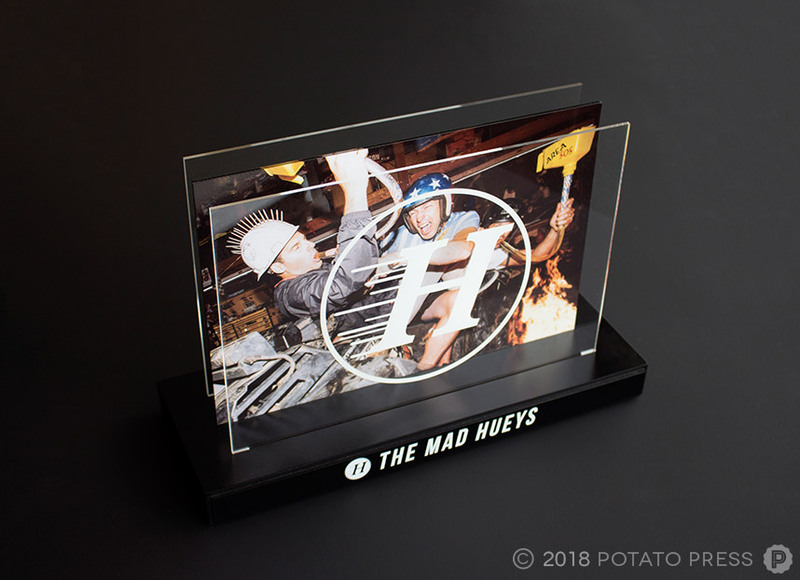 Wanting to create some custom Point of Sale or marketing products for your company, contact us today to see how we can create something bespoke for your company! 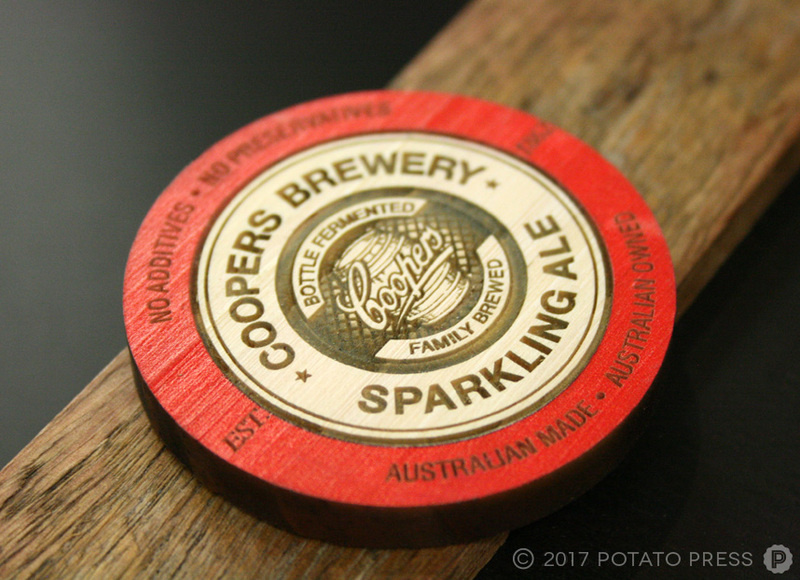 Having previously worked with Coopers on their beer tap decals, we welcomed the opportunity to work with them again and incorporated their iconic branding into this A-Frame design! 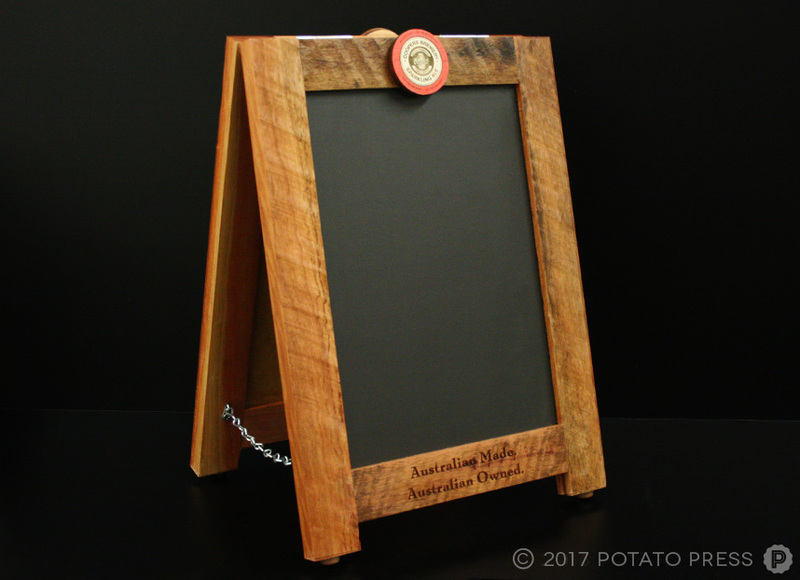 These A-Frames sit on top of the bar and contain a chalkboard so that specials and custom messaging can be displayed. 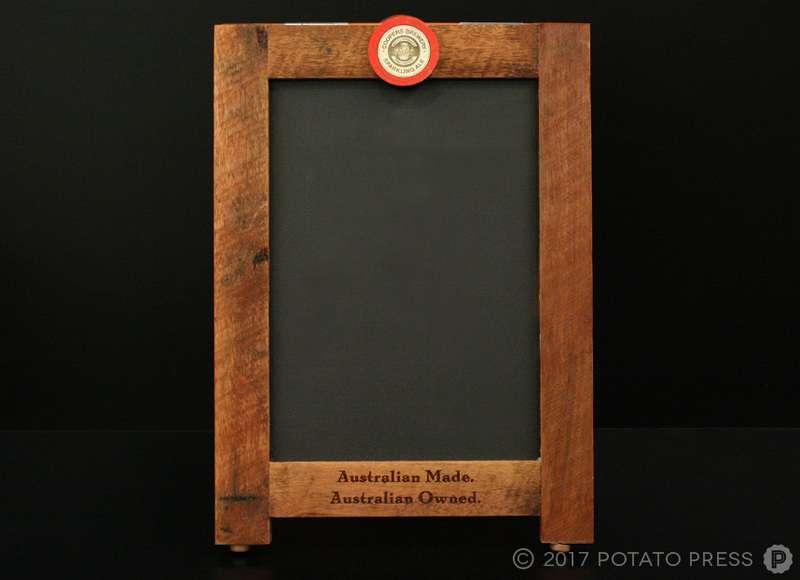 The timber is an aged rustic locally sourced timber, which creates a surrounding boarder for the chalkboard. 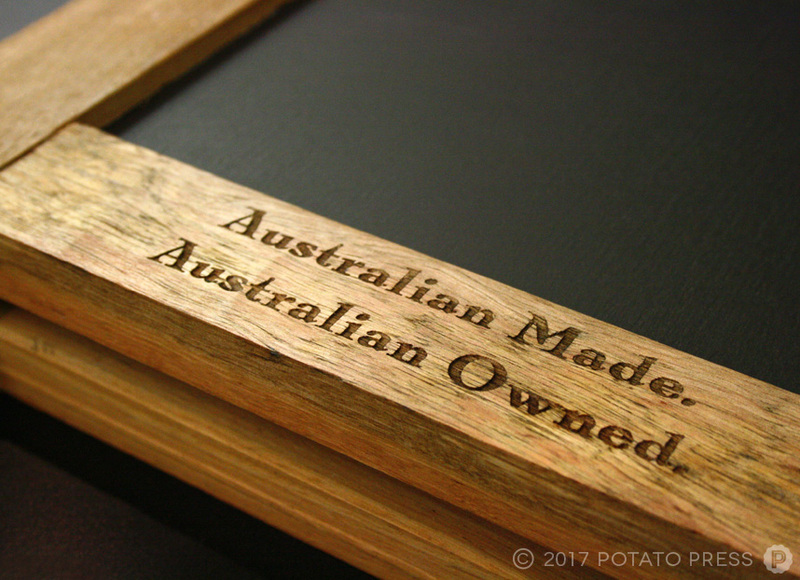 We laser etched the coopers tagline into the base of the frame which creates a tactile element for the customers to engage with. Finally, we finished the piece off with the Coopers timber decal at the top. The pop of colour against the dark weathered timber really draws in attention and sells this design. 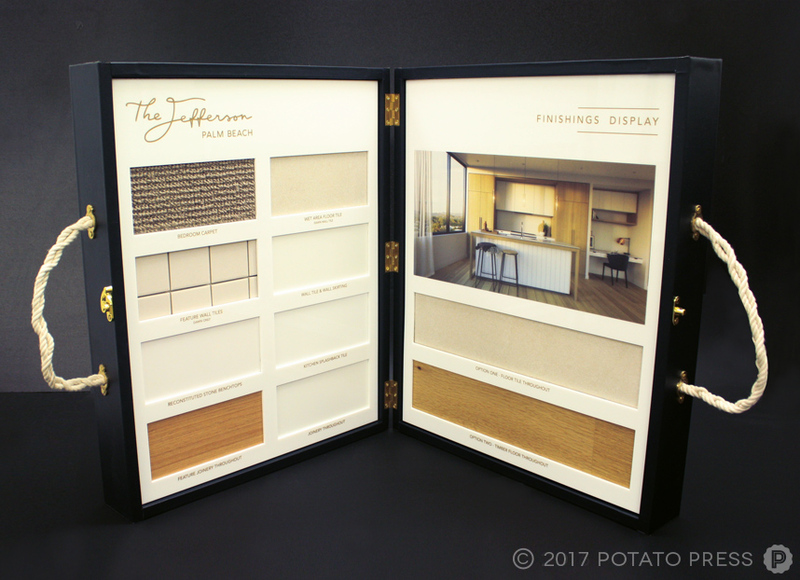 If you would love to have some custom marketing products designed and manufactured to draw in new customers, contact us today and check out our other point-of-sale projects to spark some ideas! Hurley is an internationally recognised surf apparel brand who aim to create products to enhance and make your experience in the water fun. Endorsed by bands such as Blink-182 and All Time Low the brand also sponsors many events and athletes around the world. 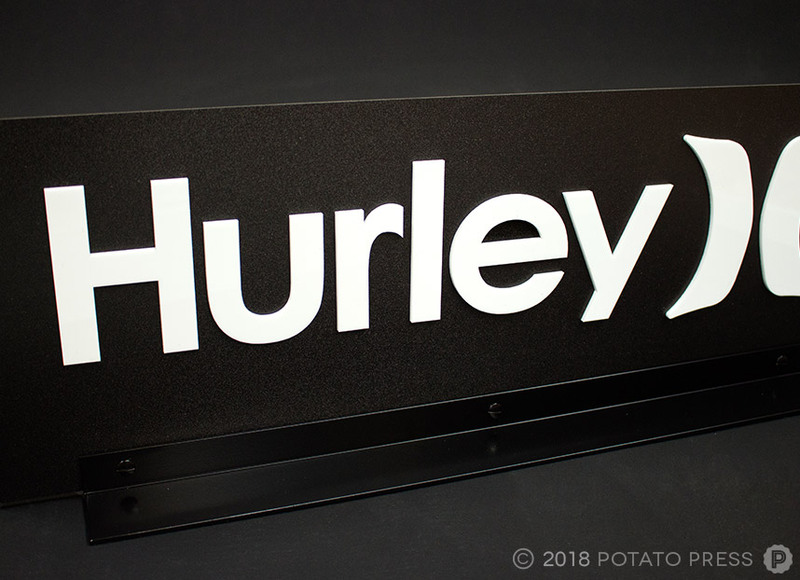 For Hurley’s latest point-of-sale marketing campaign we created a simple design to be rolled out in stores across Australia. 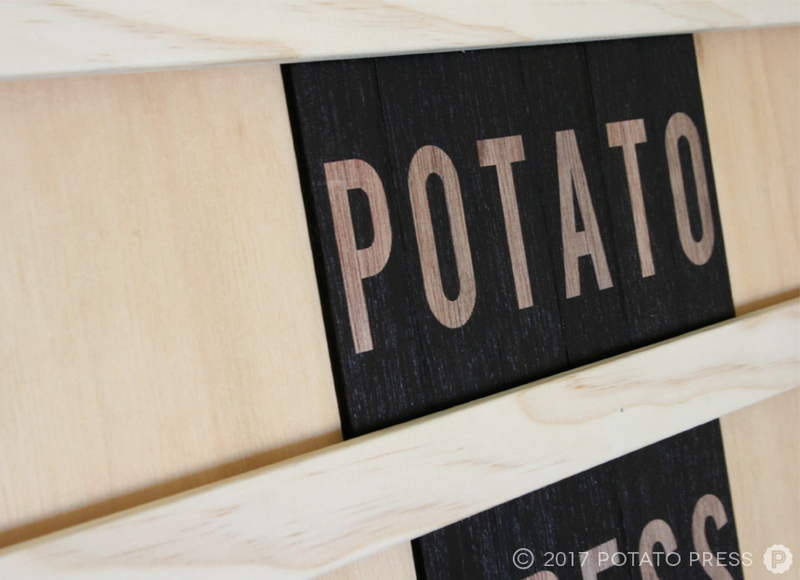 The signs are a combination of black board, laser cut white acrylic letters and black metal stands. 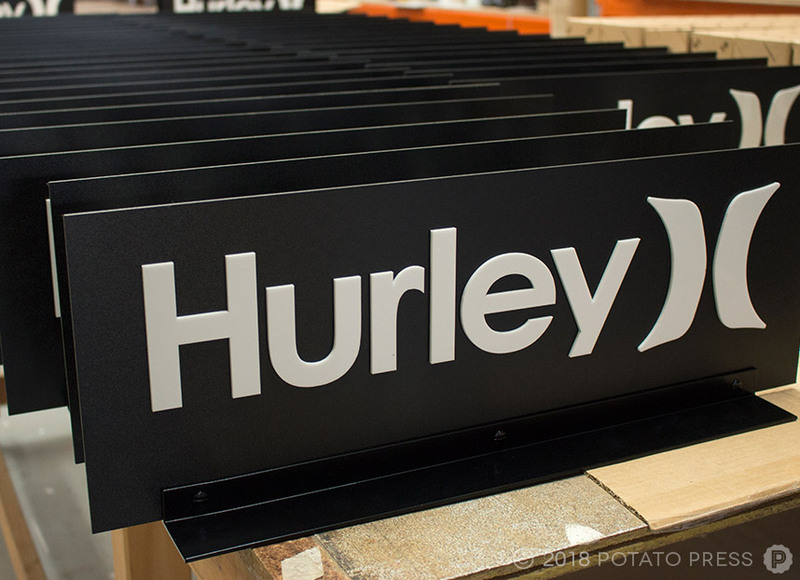 These stands are viewed from both sides and really encompass the sleek and clean essence of the Hurley brand. 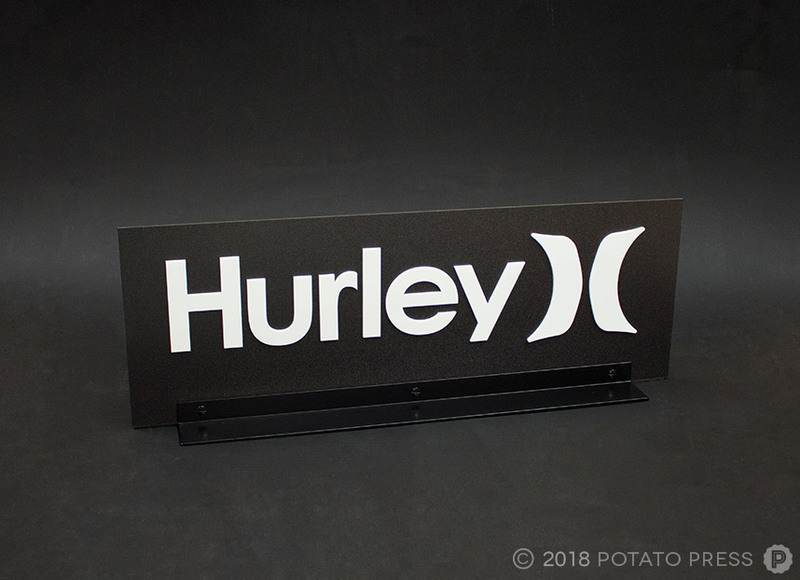 The best thing about this signage is that the main “Hurley” part of the signage can be updated with special sale offers, different logos or even photos depending on the season or style the brand wants to roll out. 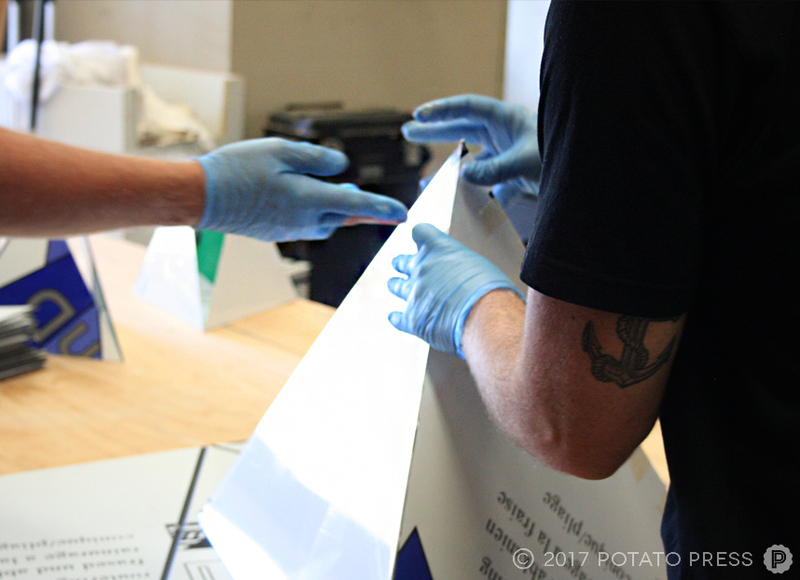 The options are endless, which makes these signs a long-term signage solution. 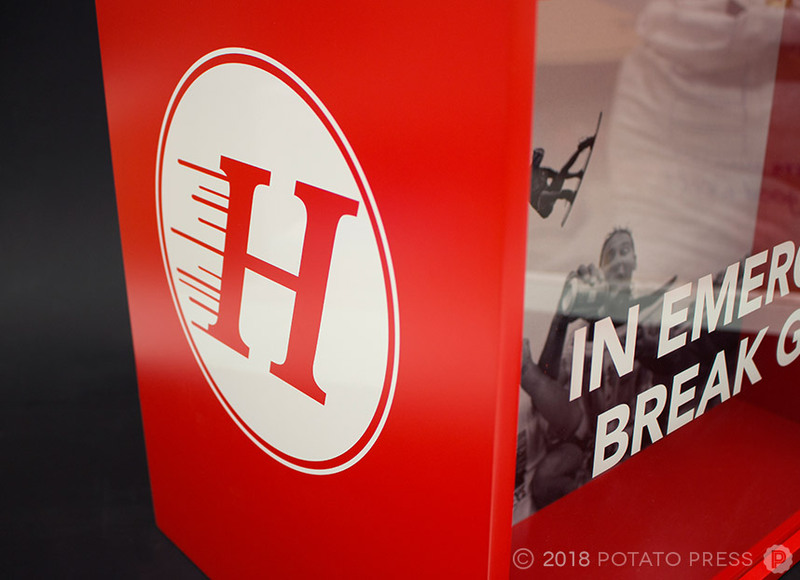 If you have an upcoming store opening or would just like to update some point-of-sale marketing displays in your store, contact us today to see how we can create some custom designs for you! 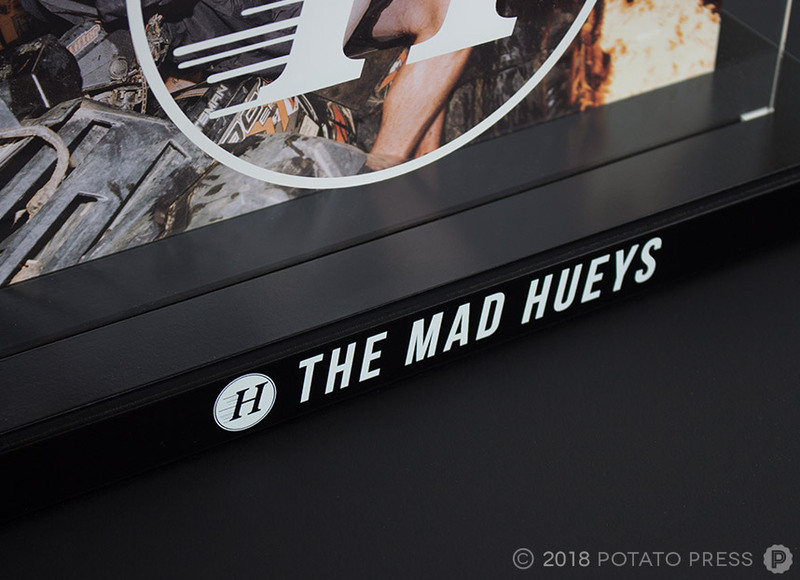 Based in Burleigh Heads on the Gold Coast QLD, The Mad Hueys is a fishing crew, who love to fish, surf and drink beer and with their name they have created an apparel brand that is sold globally. 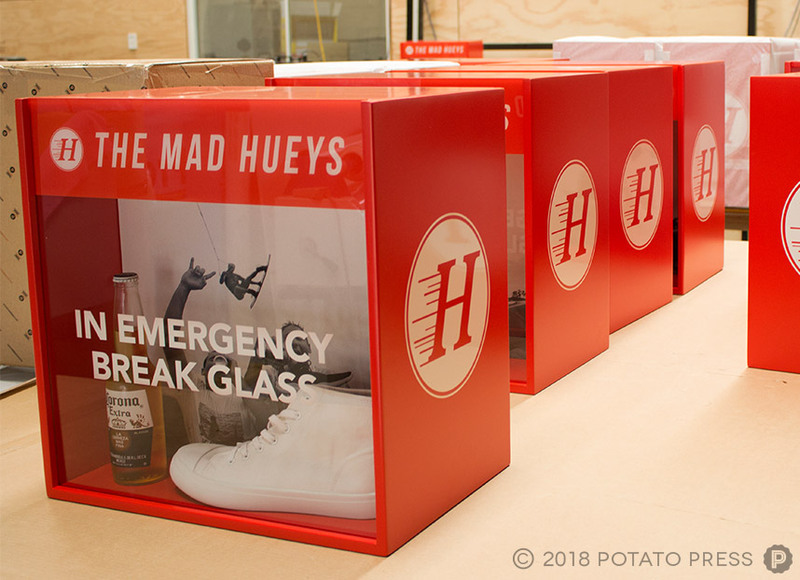 To create some point-of-sale display stands, the team at The Mad Hueys contacted us to help out. 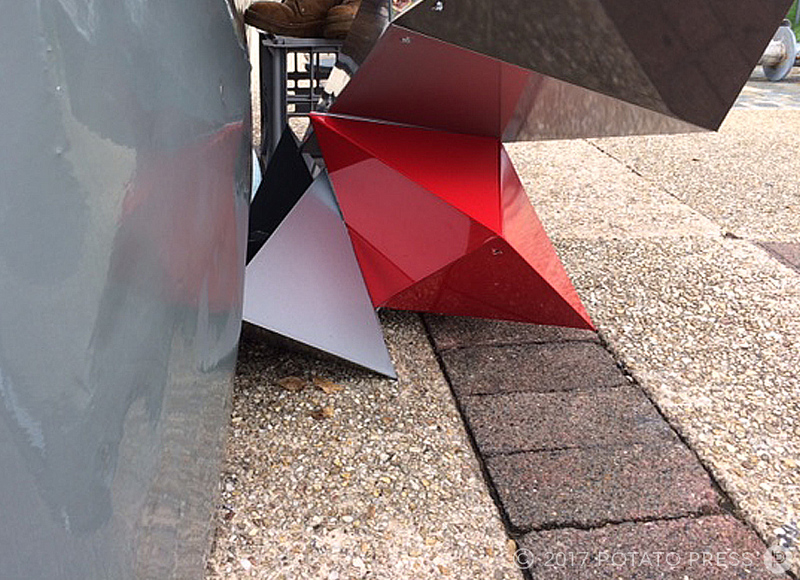 They needed something that would be placed on a table and can be easily moved, assembled and dismantled. 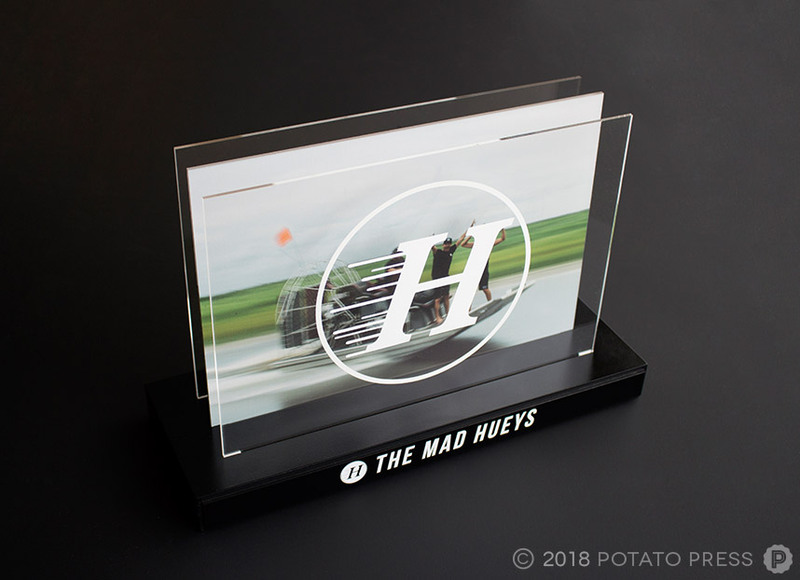 So we created a system of acrylic inserts, the middles with a different image on both sides and the front and back pieces to have the logos. These would then insert into wooden bases for an easy install! 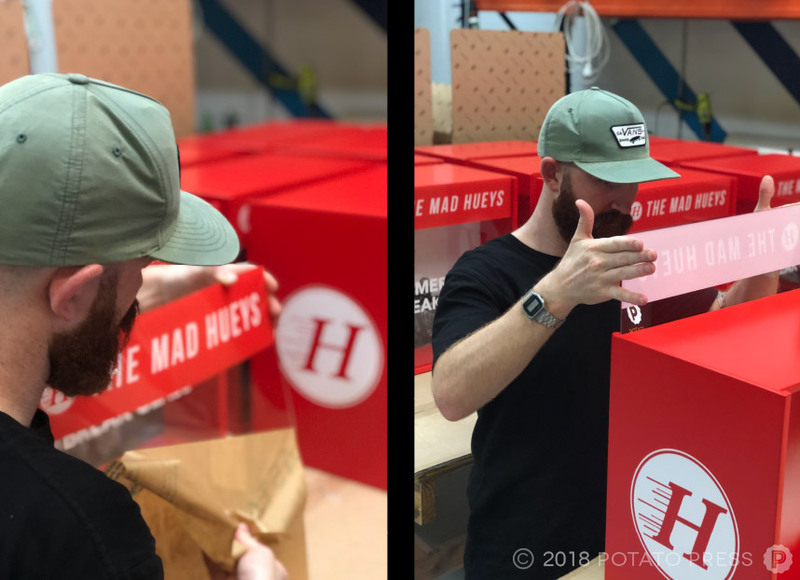 If your brand is looking into having some custom made POS created, contact us today to see how we can create something special for your company! An Australian home design and building company operating since 1976, Metricon focuses on quality over quantity, creating homes people are thrilled to live in due to their high standards of excellence and innovation. With locations throughout Victoria, New South Wales, South Australia and Queensland, Metricon recently created a coveted partnership with several of Australia’s most iconic homeware and design companies, dubbed the ICON Collection. As part of the collection, homeowners are invited to spend $5,000 on a variety of homeware luxuries and comforts for their brand new Designer by Metricon home, and receive up to 10x the value – or $50,000 – at no additional cost. 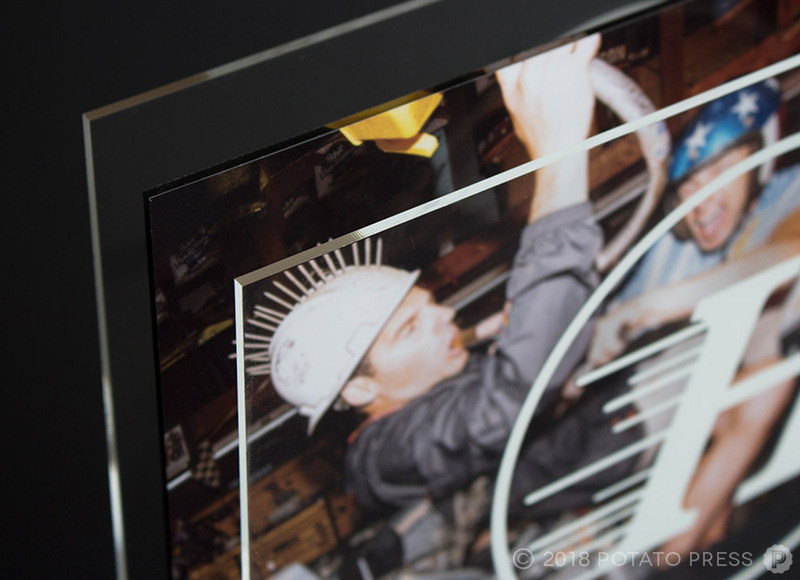 Tasked with creating ICON Collection collateral for Metricon, our designers used both removable and fixed bases for the product, allowing the client to choose whether to use it as a wall hanging or free standing display item. CNC milled solid Australian hardwood timber was chosen for the base material, and printed gloss black acrylic discs were added to feature the ‘Proud Partner of the Designer ICON Collection 2018’ copy, as well as the Metricon logo. 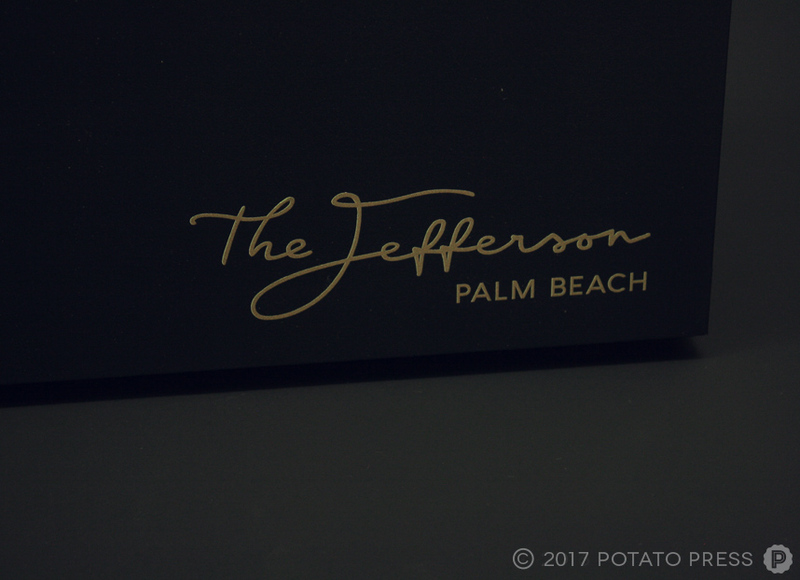 This clean yet thoughtful design was the perfect addition to Metricon’s modern, immaculate aesthetic, and we are delighted with the outcome. 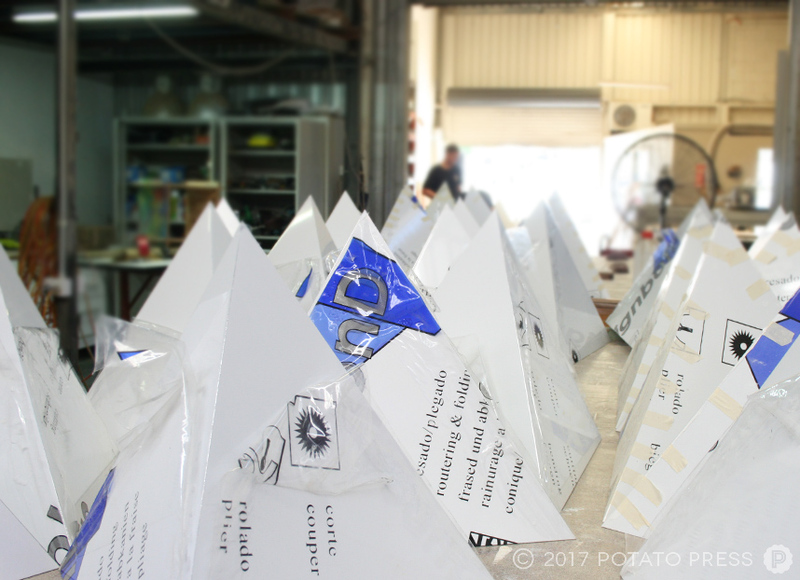 Interested in creating custom product for your business? 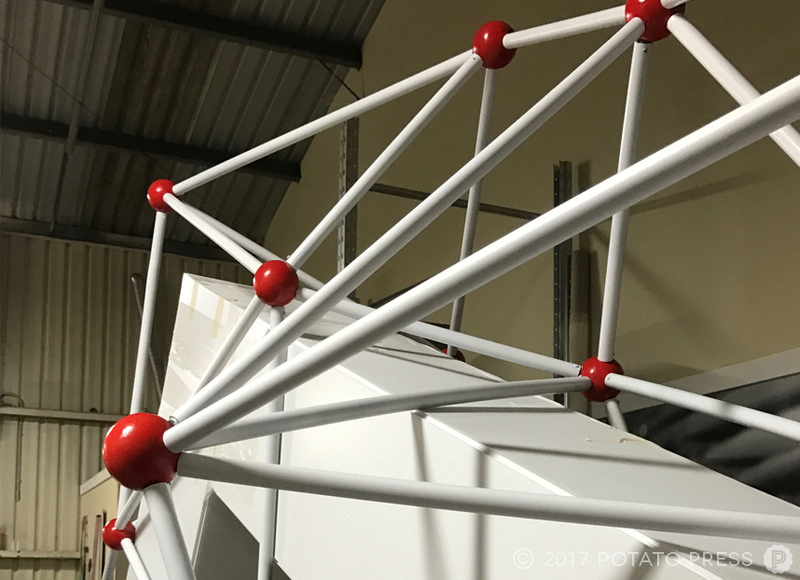 Contact us directly to discuss your project with our recognised design team. Based in Melbourne, Australia, Baharian Wealth Management is a boutique wealth management firm for individuals and families looking to properly manage their assets. With a focus on being “bigger than small, but smaller than big,” Baharian has acquired a widely respected and trusted reputation for clients both locally and afar. Seeking a one-of-a-kind art piece for their office reception area in the Melbourne CBD, Baharian contacted us for a custom corporate artwork project. Using their intricate logo design as inspiration, we created a 1200 x 1200 artistic piece to be mounted on the reception room wall, all hand assembled by our team of skilled designers. 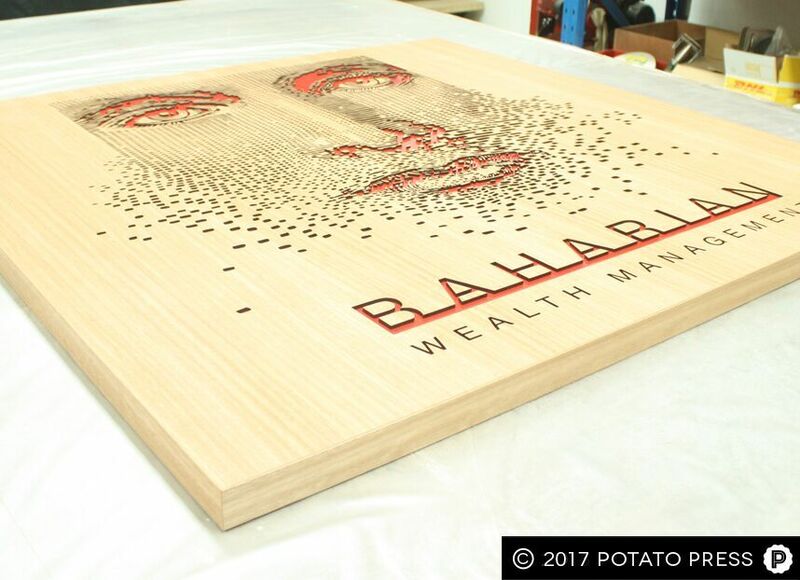 Beginning with a slab of quality blackbutt timber, we used our laser cutting technology to recreate the Baharian Wealth Management face logo with splashes of the custom PMS matching red colour for emphasis. With the unique laser cut facial elements and underlying logo design, Baharian was truly impressed with the quality and proud to display the piece in their local Victoria office. For custom artwork projects or similar enquiries, please contact us directly for questions and quotes. We look forward to hearing from you. 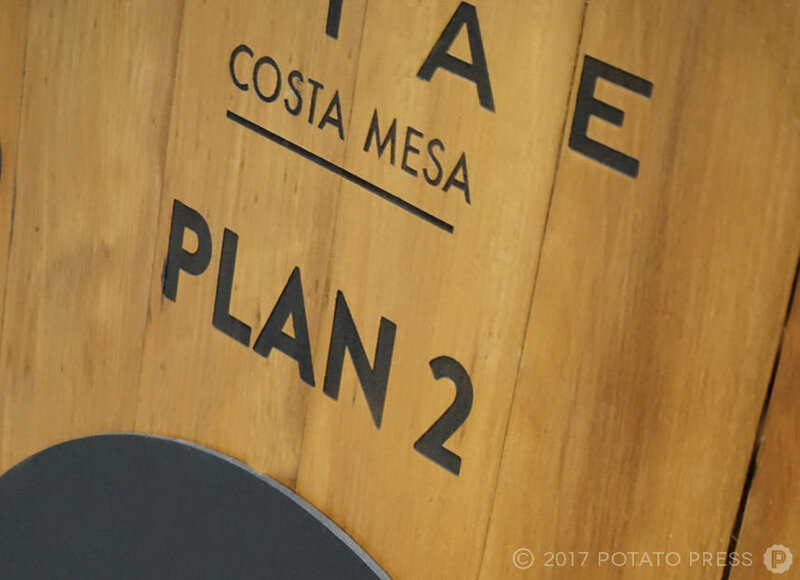 Located 60 kilometers southeast of Los Angeles, the city of Costa Mesa has grown from a semi-rural farming community in California to a suburban metropolis, primarily known for its temperate, beachy climate and assortment of retail and commercial spaces. 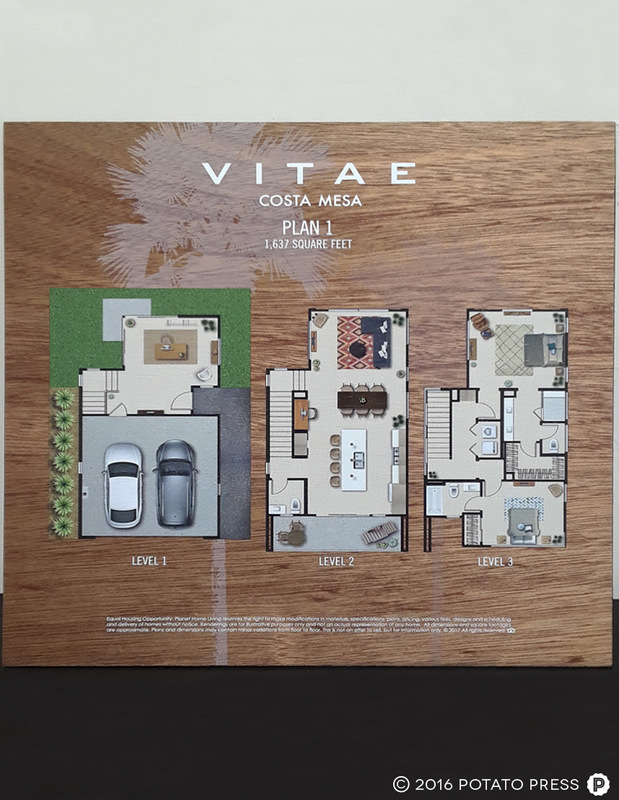 With a new Vitae Costa Mesa housing development currently underway, we were contacted by a marketing team to create custom timber pieces to complement the style of the houses being sold. 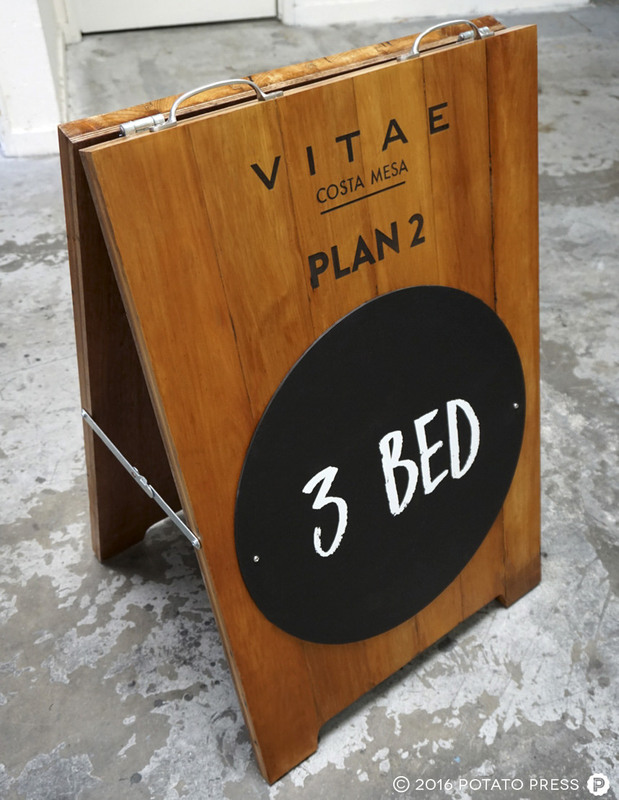 After looking at the design outline, we created a series of Vitae A-frames and floor plans, all hand assembled in our Huntington Beach workshop and made of solid timber. 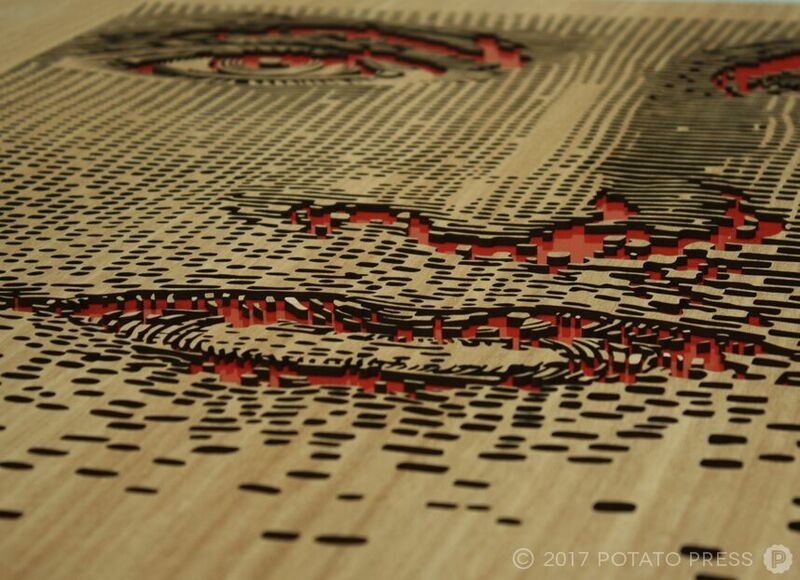 Made with a custom shape, our highly skilled team members also used a cnc router and UV printed marine ply, drawing attention to the laser etching and engravings as well as the mechanical hinges. 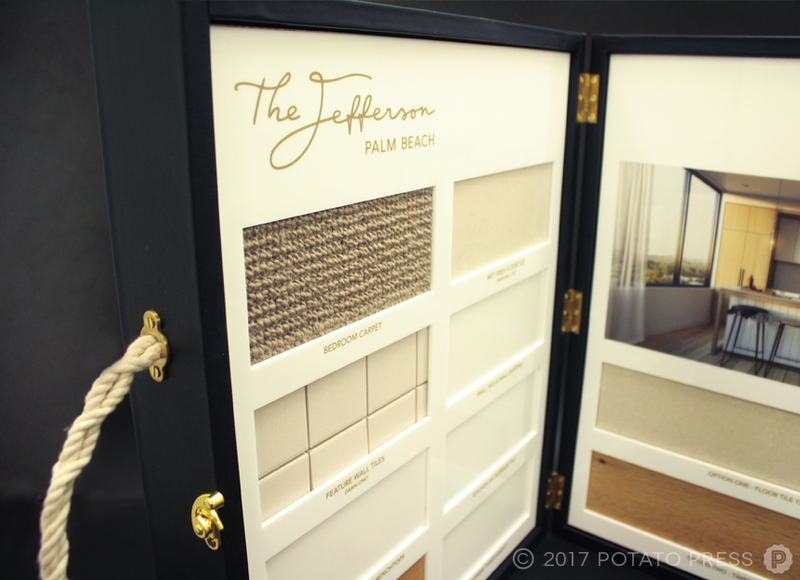 We loved creating beautiful pieces for these Californian homes, and the future residents enjoy them as well! 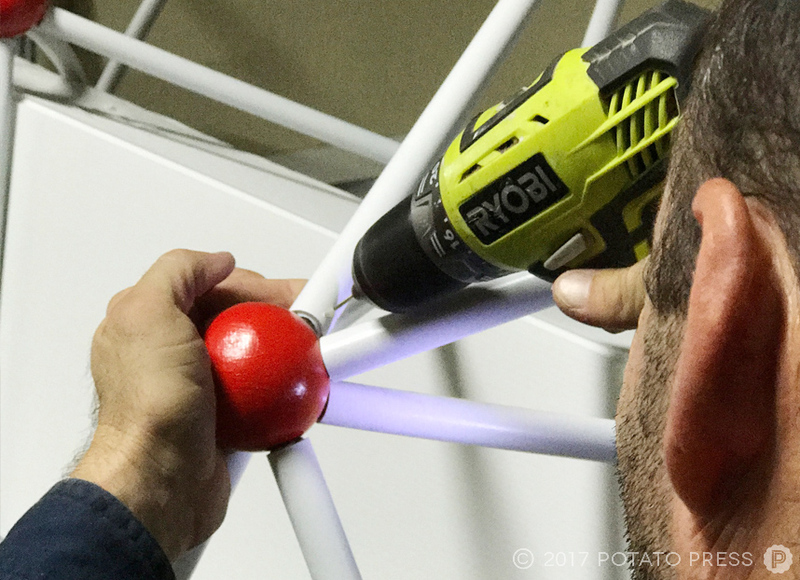 Do you have a project you’d love to see come to life? Contact our team today! 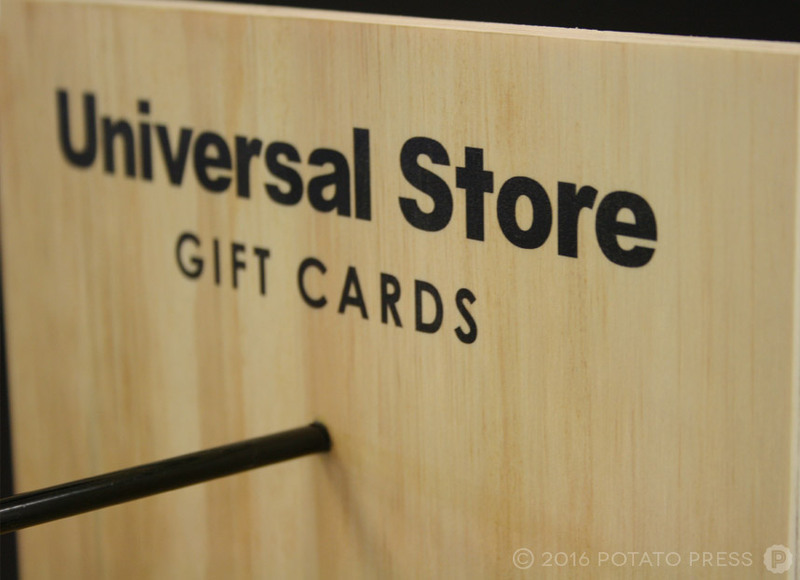 With 45 retail locations around Australia, Universal Store is one of the most popular retail destinations for modern women and men’s fashions, including youth, street and casual wear. Stocking leading brands such as Adidas, Thrills, Converse, Stussy, Lee, Vans, Wrangler and more, Universal Store also has a successful online shop for those who prefer to shop from the comfort of their computer or phone. 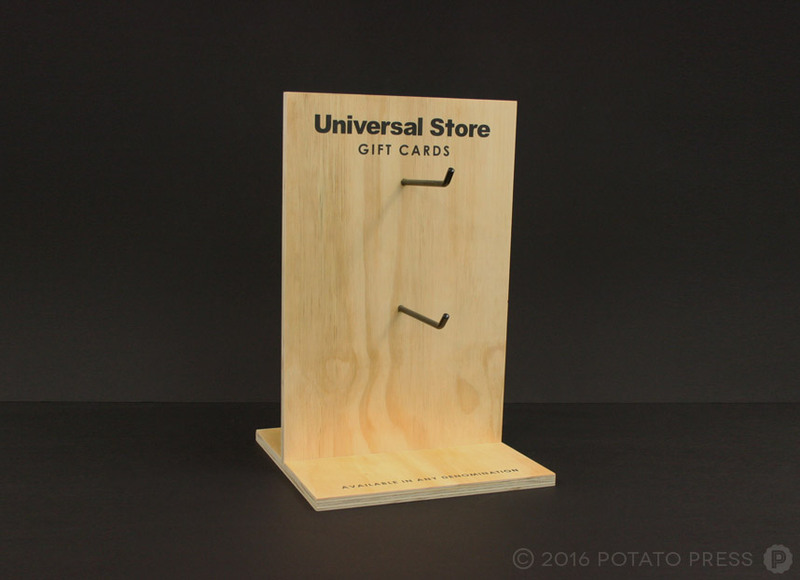 Seeking an elegant display for their gift cards, Universal Store contacted us to create something sleek and polished to match the aesthetic of their recognized national brand. 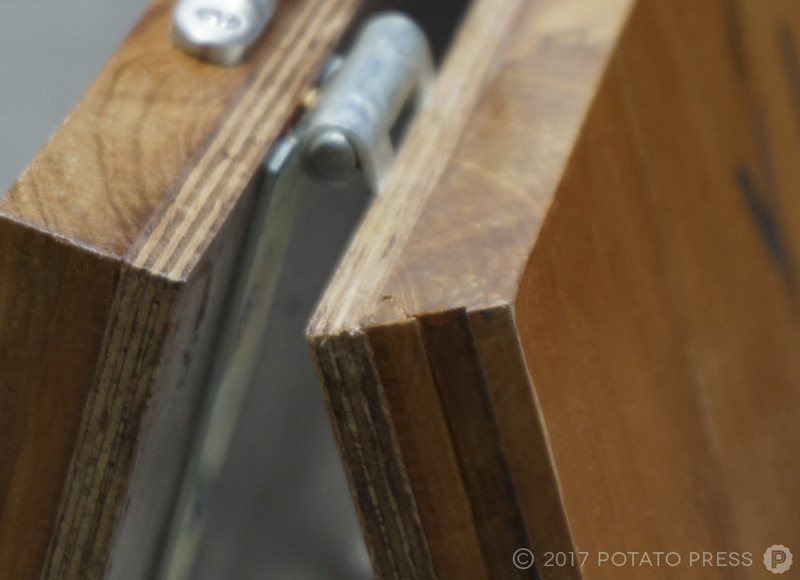 Wanting to keep it simple and fully-functional with a clean look, we used routed plywood timber in a custom size, designed to perfectly suit the brand and display area. 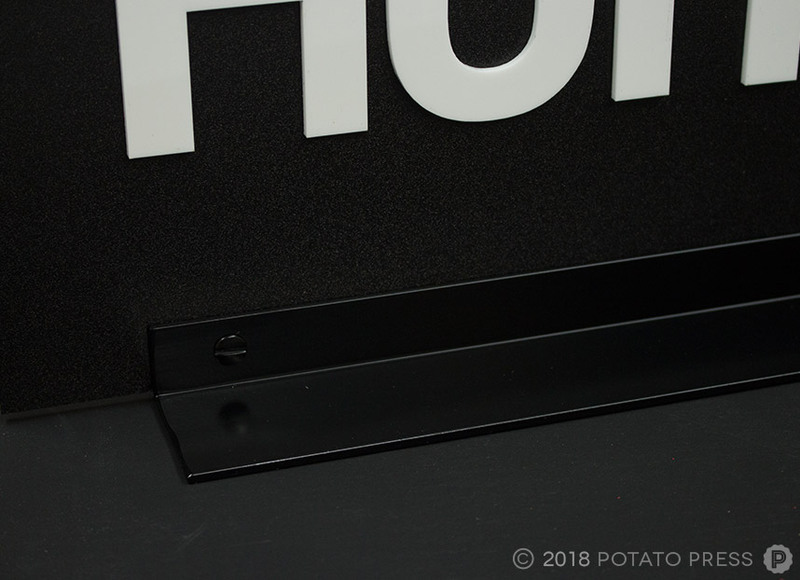 Made to stand on the counter at the point-of-sale area, we added a direct imaged logo, as well as two black plastic coated ‘arms’ for the gift cards to conveniently be placed on. 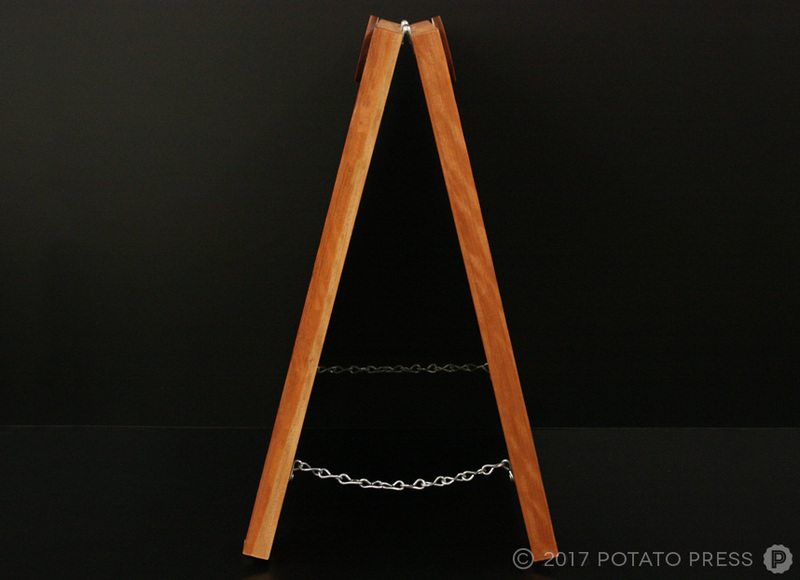 While this custom wooden gift card stand wasn’t too much of a challenge for our top-notch team, the client was happy with the outcome and look of the stands in the stores, and that’s an outcome we’re proud of. 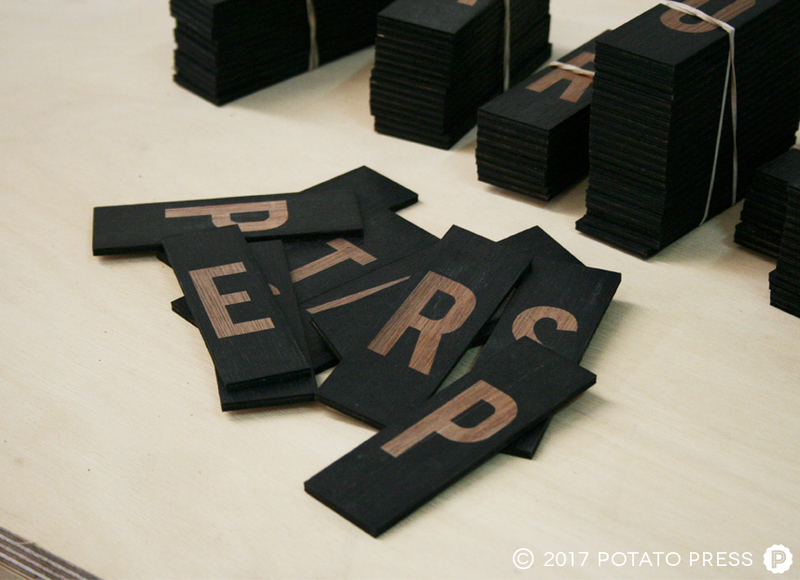 For your next custom retail store item, be sure to contact Potato Press by email or phone. We look forward to chatting with you! 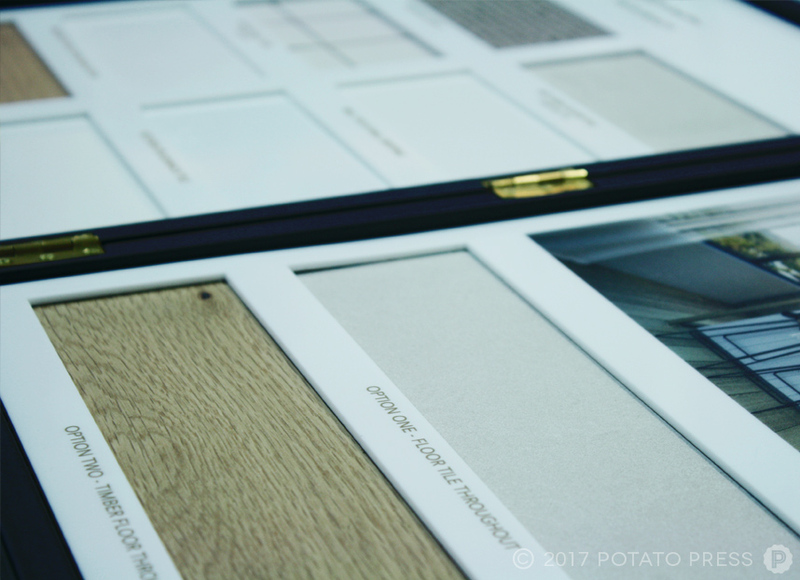 We have made many finishings display / samples boards here at Potato Press, but this one was designed a little differently. 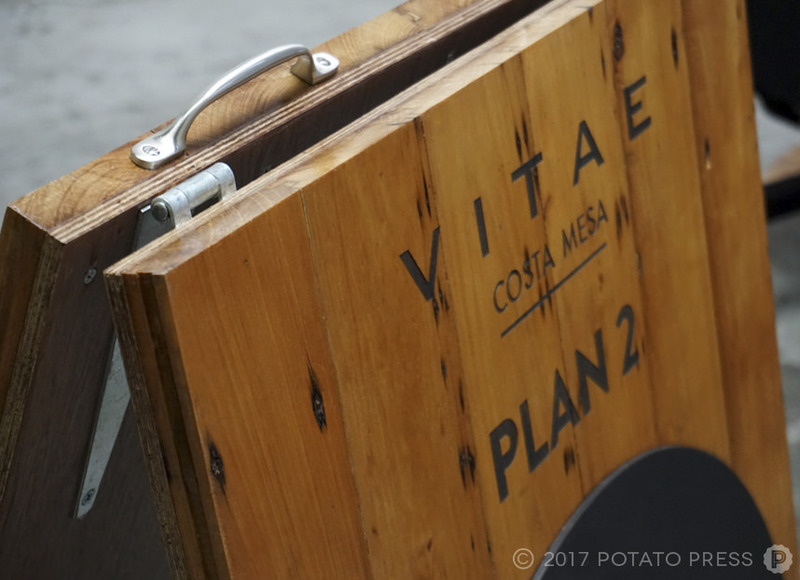 It was created in the style of an easy carry briefcase that our client could easily transport to and from different sites she was traveling between. Created with a custom leather wrapped outer shell with subtle branding on the outside. 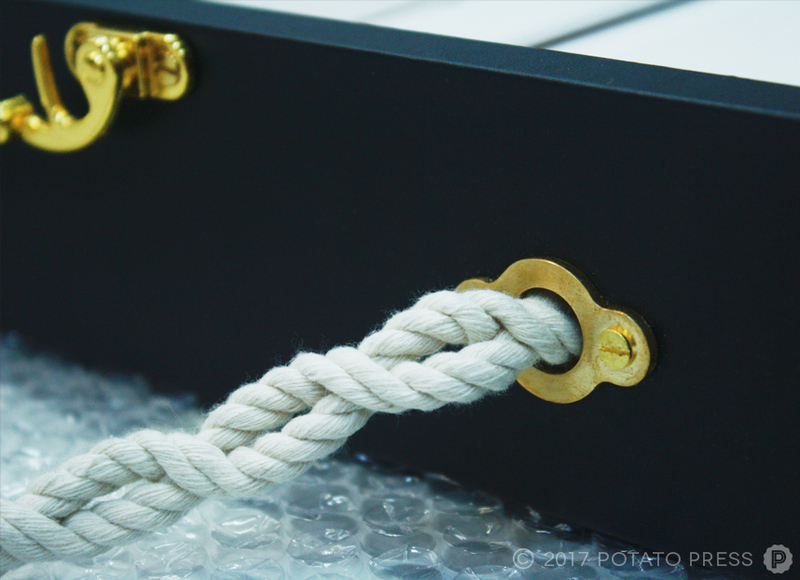 We hand wove rope for the handles that were fixed into place with custom solid brass fittings cut in house. 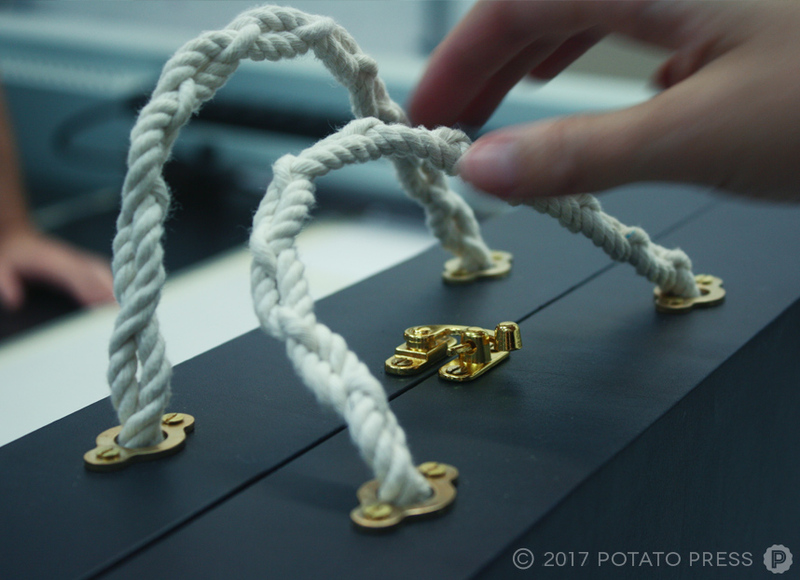 The case opens up and lays flat on its back to the viewer can browse through the samples. A lot of small elements add up to create one big impact with this one, we hope you like it as much as we enjoyed putting it together! 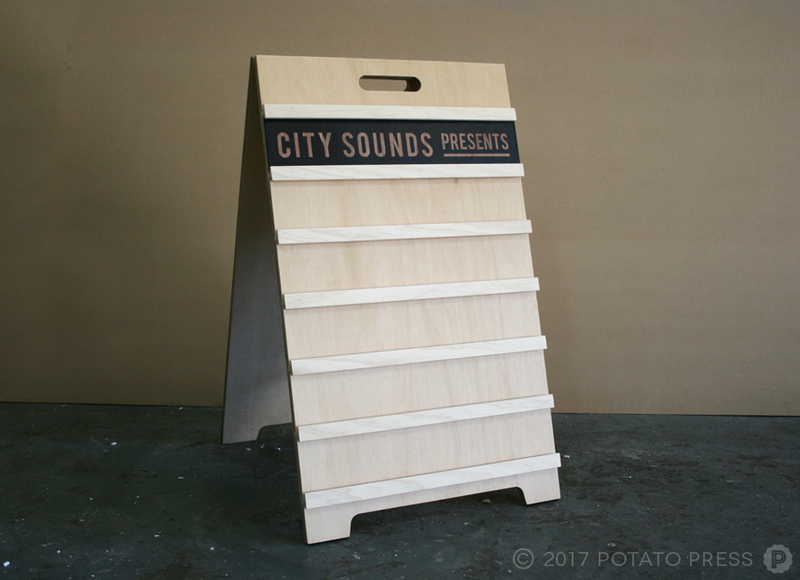 This was a cool little project for Brisbane’s City Sounds. 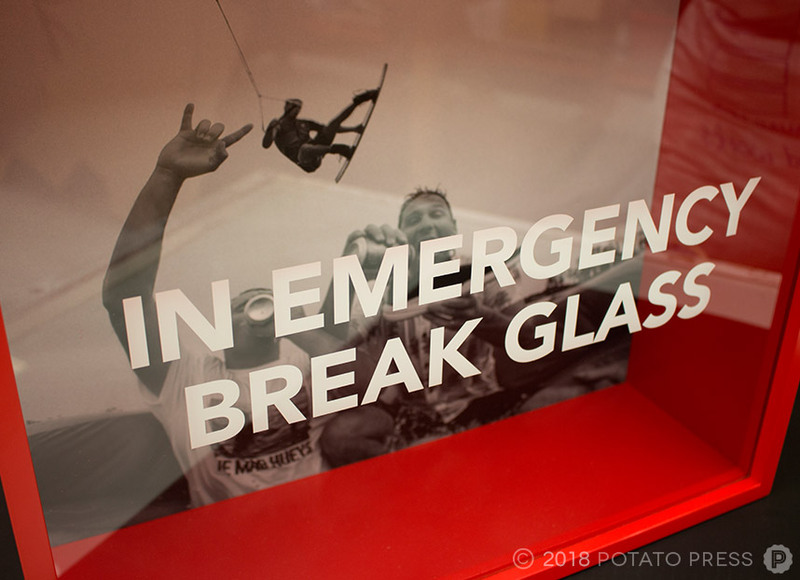 This timber a-frame had interchangeable letters so the message could be updated and the frame could be re-used. 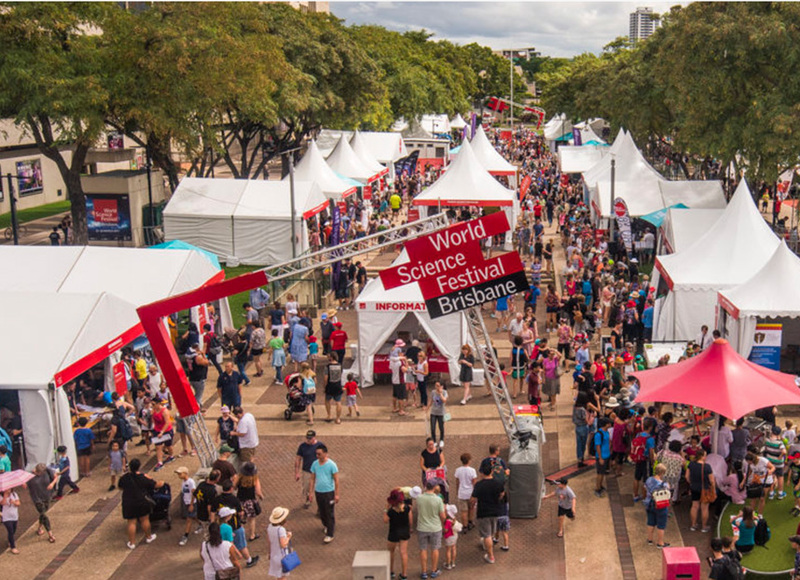 The Queensland Museum Network holds exclusive license to host the World Science Festival in the Asia Pacific, reinforcing Australia’s position as a knowledge economy and igniting new and challenging discussions in and about Science, Technology, Engineering and Maths (STEM). The Event had a turn out of 120,367 attendances – double what was anticipated. 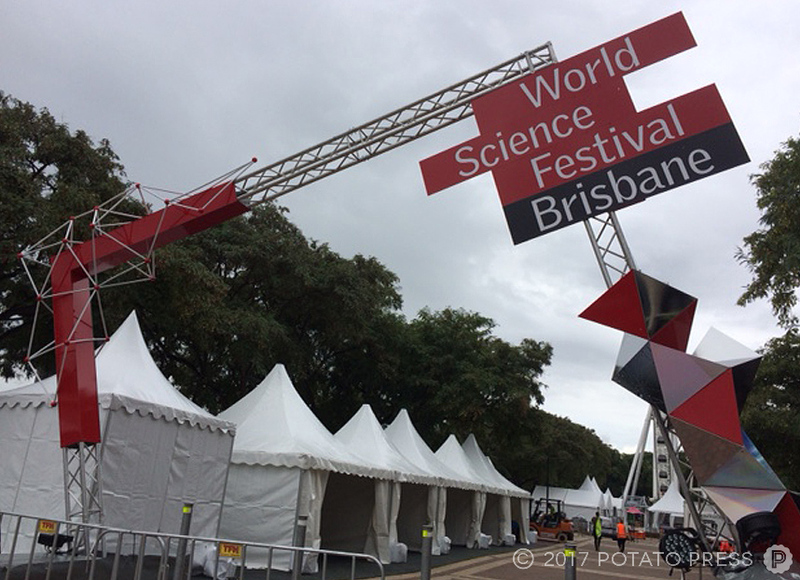 247 participants and exhibitors from 10 countries showing all kinds of Science goodness. So it was great fun working in conjunction with Sharon Penny some ‘sciency’ sculptures for both entrances. 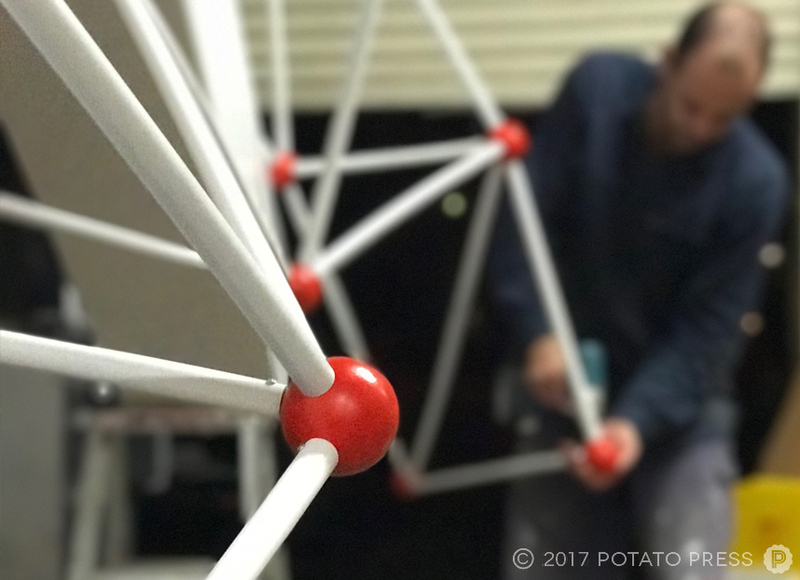 We used a varying combination of materials to create a molecular inspired piece, and a multifaceted crystal-like structure mounted to preexisting trusses. 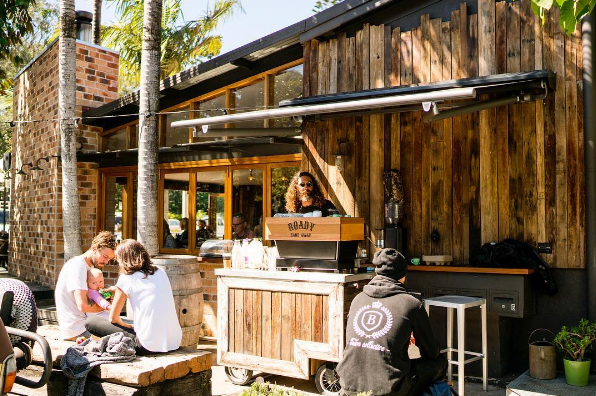 A charming coffee house and restaurant located in Byron Bay, The Roadhouse features a menu of nourishing whole foods, gathering much of their inspiration and ingredients through sustainable farming and sourcing of the best locally-grown produce. 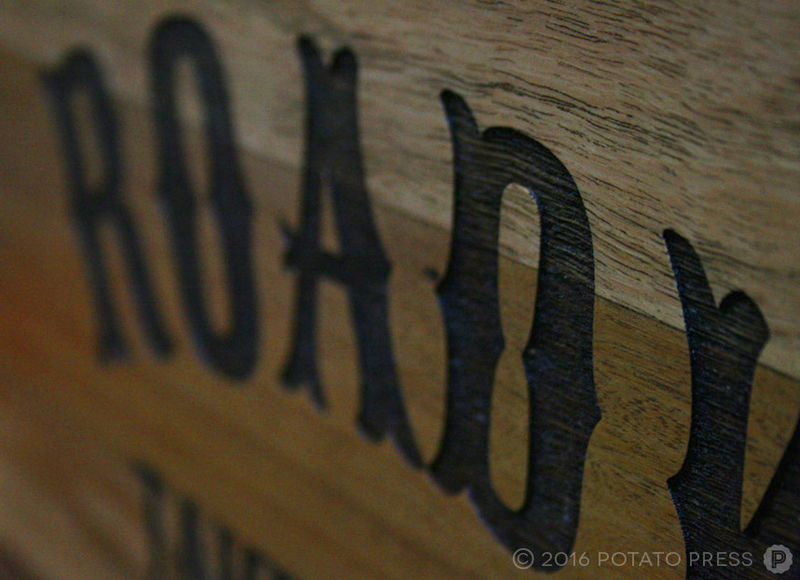 Featuring a rotating daily menu of Breakfast, Lunch and Dinner items proudly displayed on their Hunter & Gatherers Board, The Roadhouse is an Australian staple for foodies, locals and visitors alike. 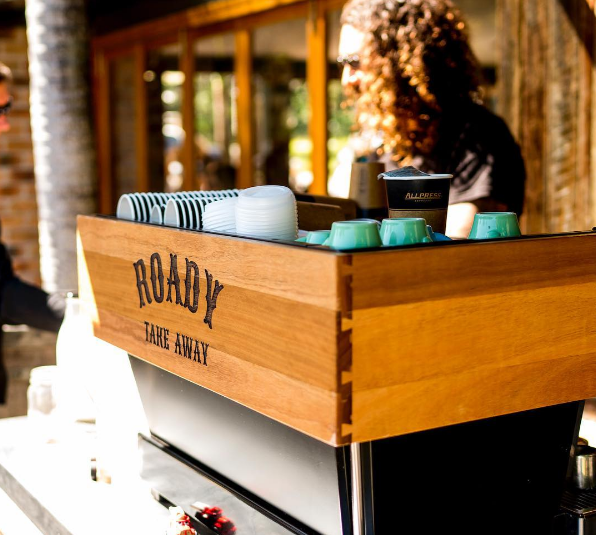 Tasked with creating a custom cover for their in-house espresso machine, we laser-etched the popular ‘Roady’ branding onto beautiful native hardwood timber, reflecting their passion for the use of natural materials. 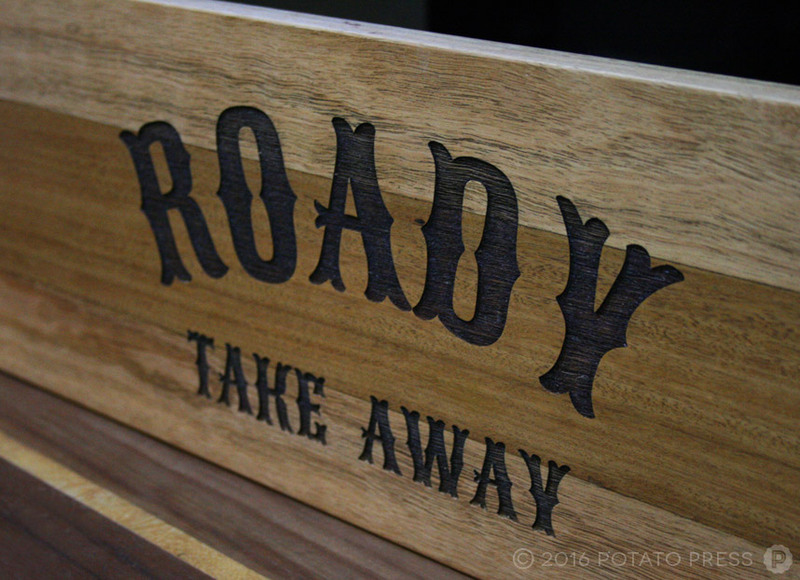 Adding classic joinery design and a simple laser-etched ‘Take Away’ under the custom branding, we are proud of our latest work for this sustainable, eco-conscious local business.